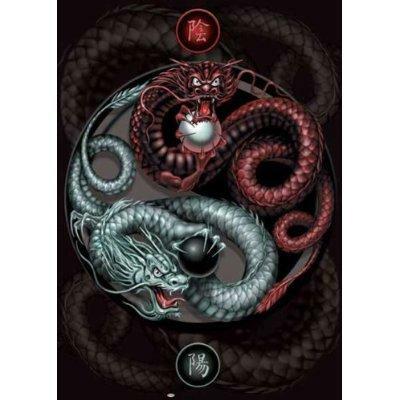 Yin yang dragons and yin yang dragon pictures combine some powerful concepts. What is the energy of each dragon and how does their interaction affect the flow of chi throughout the universe? Yin yang symbols are easily recognized, and even if you've never studied the deeper meanings associated with them, it's easy to get an idea of what they represent just by examining them. 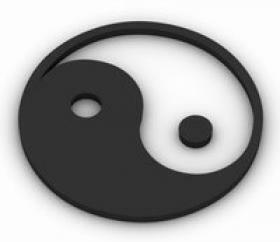 A basic yin yang symbol is a circle composed of two haves. One is light, the other dark. The halves are divided in a kind of fishtail design with one perfectly fitted to the other. Within each half, there is a drop of the opposite half's color. It's easy to divine that these two halves represent opposites, and that the two drops show that both sides have just enough in common to attract one to the other. Each half, although opposite, perfectly complements the other to form one very balanced whole. The yin yang symbol is used to represent the flow of energy through all things in the universe. Newton's law maintains that for every action, there is an equal yet opposite reaction. This concept is beautifully represented in the simplicity of the basic yin yang. It's impossible to separate the concepts of the yin yang and feng shui from the basic principles of Chinese astrology, and dragons hold a powerful role in the Chinese zodiac. The dragon is a mystical creature believed to bring good fortune when its energy is properly harnessed. As it relates to Chinese astrology, the dragon is believed to be represented in the symbols for the nodes of the moon. Each node looks rather like a horseshoe, with a small circle at each end. One end represents the dragon's head. This energy pulls things in a forward direction. The other end represents the dragon's tail, and this end tends to drag things backward into the past. Due to this conflicting nature, it takes the energy of two dragons, each one following the other one's tail to keep things moving along in balance. Some yin yang symbols incorporate dragon art into the design. Although this certainly creates a very attractive piece of art, it carries deep symbolism as well. To fully understand this symbolism, it's important to examine the type of energy each dragon projects. Yang dragons radiate a bright, positive energy charge, and they are typically represented as wingless. Heavily influenced by the planet Mars, this type of dragon also projects a masculine air. This energy is very physical, and it is often interpreted as courageous, daring, outgoing and very direct. It's the energy of a doer that gets things done. It acts rather than reacts. However, this kind of energy is often brash, so it needs tempering to make it most effective without leaving damage in its wake. The yang dragon's yin partner provides that tempering. As with all things yin and yang, the yin dragon's energy is quite the opposite to that of the yang dragon. Heavily influenced by the planet Venus, the winged yin dragon emits a negative energy charge. This darker, mental type of energy is primarily female in nature. While the yang dragon charges ahead in a frenzy of activity, the energy of the yin dragon is more thoughtful and introspective. It may not present the flash of energy associated with yang, but yin energy is known for its powers of endurance. The interaction of energy between these yin yang dragons is symbiotic. The brash yang spurs the introspective yin into action when she would rather drift. The intuitive yin provides better guidance to the sometimes impetuous yang, helping direct his energies in the most productive paths. Together, they generate the ebb and flow of energy that propels the universe and everything in it, and this flow of energy known as chi is a founding principle of feng shui. Armed with the knowledge of these two powerful dragons, you can now use them in your feng shui designs and environment. The critical component is to remember to balance both the yin and the yang of the dragons to ensure one doesn't overwhelm the other. Dragons are powerful feng shui symbols and need to be regarded with high respect.